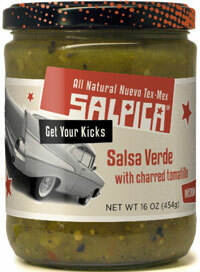 Buckle up and hit the gas with Salpica Salsa Verde With Charred Tomatillo. This wild, green ride puts you in the driver's seat. Do not brake for dinner and do pick up hitchhikers. 16oz. Roasted fresh tomatillo, roasted fresh tomato, filtered water, Hatch Valley green chile (green chile, salt, citric acid, calcium chloride), serrano chile, fresh onion, Anaheim chile, salt, lime juice from concentrate, fresh garlic, fresh cilantro, xanthan.